An image scanned from a hand-colored lithograph from Atlas of Plates Illustrating the Geology of the State of Maine Accompanying the First Report on the Geology of That State by Charles T. Jackson, M.D., State Geologist, published by order of the Legislature of Maine in 1837. This plate, Pl. 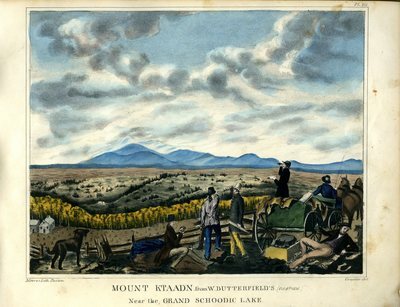 VII, by German artist Francis Graeter and printed by Moore's Lithograph, Boston, includes the caption, "Mount Ktaadn from W. Butterfield's (Oct. 8th 1836) Near the Grand Schoodic Lake."